Fleetwood Town striker Conor McAleny has joined SPL side Kilmarnock on-loan until the end of the season. McAleny, 26, joined Town on a free transfer from Premier League side Everton in the summer of 2017. But the forward has been hit by injuries and has played just 14 times in the league this season. 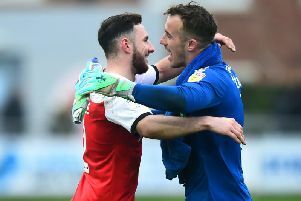 McAleny has just to net in League One this term and has fallen behind 16-goal Paddy Madden, 12-goal Ched Evans, seven goal Wes Burns, seven goal Ash Hunter and Ashley Nadesan. Nadesan went straight into Town boss Joey Barton's starting line-up after his return from a nine goal loan spell at League Two side Carlisle. With competition up front rife McAleny, who is under contract until the summer of 2020, has joined the SPL side to gain regular game-time. Steve Clarke’s Kilmarnock side sit third in the table, level on points with Rangers and just three points off league leaders Celtic.